If you grew up in the 1960s, it's likely that you would have watched an animated television program called the Flintstones. A playful take on entertainer Jackie Gleason's "The Honeymooners" series, it broadcast the exploits of a "modern Stone-Age family." This pattern is a nod to that show and those times, and a great choice for a 1960s or modern-day costume for 14.5" dolls. The tunic has three main pattern pieces and is designed for use with non-fraying fabrics to eliminate hemming. This quick and easy-level sewing project is a great choice for craft-show sellers, Etsy vendors, and would also be a perfect mother-daughter project for cold winter months. Non-fraying costume suede, faux suede, or a cotton quilter's fabric backed with lightweight iron-on interfacing can be used to create the dress. 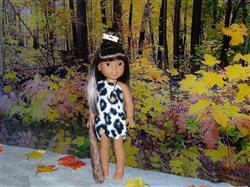 Instructions for the fashionable Stone Age accessories are also included. 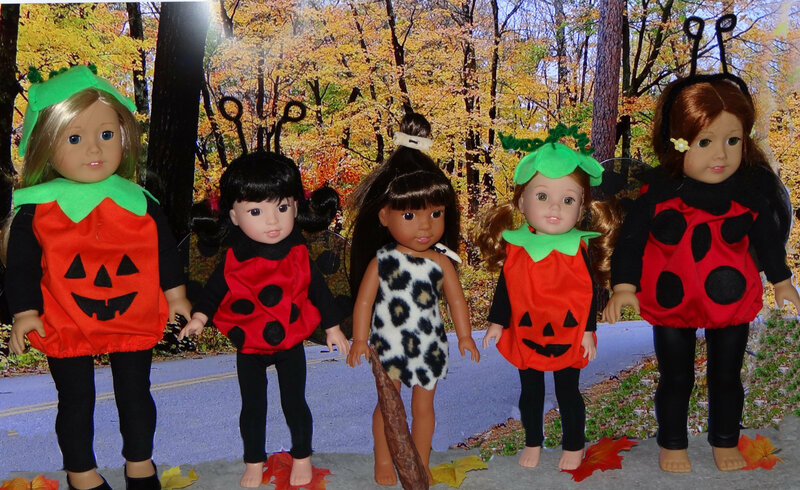 This PDF sewing pattern is designed to fit 14.5 inch dolls such as WellieWishers™. It is also available for 18" dolls such as American Girl®. 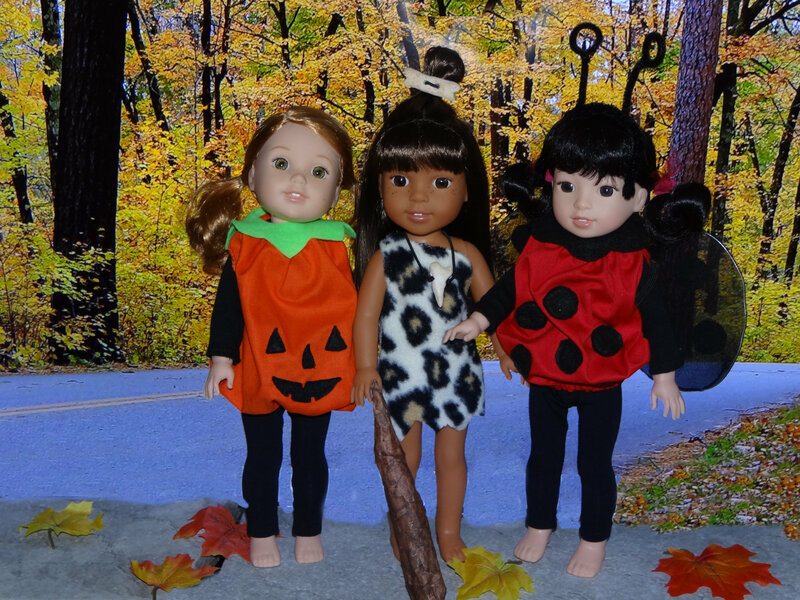 This adorable Flintstone ( PEBBLES) costume with tooth necklace, bone hair ornament, and BAM BAM stick was so much fun to sew!! The pattern was simple and fits perfectly. And the instructions for the dress and accompanying accessories were clearly explained with adequate photos and easy to follow. You will love this pattern! ASTAST TOUCH! What a cute outfit. The pattern is so simple. I used fleece and it worked perfectly! The details of the bone hair decoration and the tooth necklace is such a great finish for the outfit and also very easy to create ( actually had my husband make them for me) complement to . And the 'bam bam stick' is the perfect LASTTOUCH. have made a few Hallowe'en costumes this month. Hope you like them.. Keep up the good work making these fantastic patterns. enjoy PUMPKIN month!